I haven’t felt like cooking this week. Work has been manic and I’m exhausted by the time I return home every evening. I’ve also had a few dinners out (un-bloggable Toby Carvery meals, market stall burgers and M&S sandwiches), so I’ve been missing my little kitchen. Yesterday was my last day of freedom from shift work, so Mr Q and I headed to Columbia Road Market for a mooch around. We stumbled upon The Royal Oak and enjoyed a few small plates of tapas and far too many drinks. Feeling merry, we tottered out into the square behind the main market where we found a guy selling all manner of lovely French goodies. 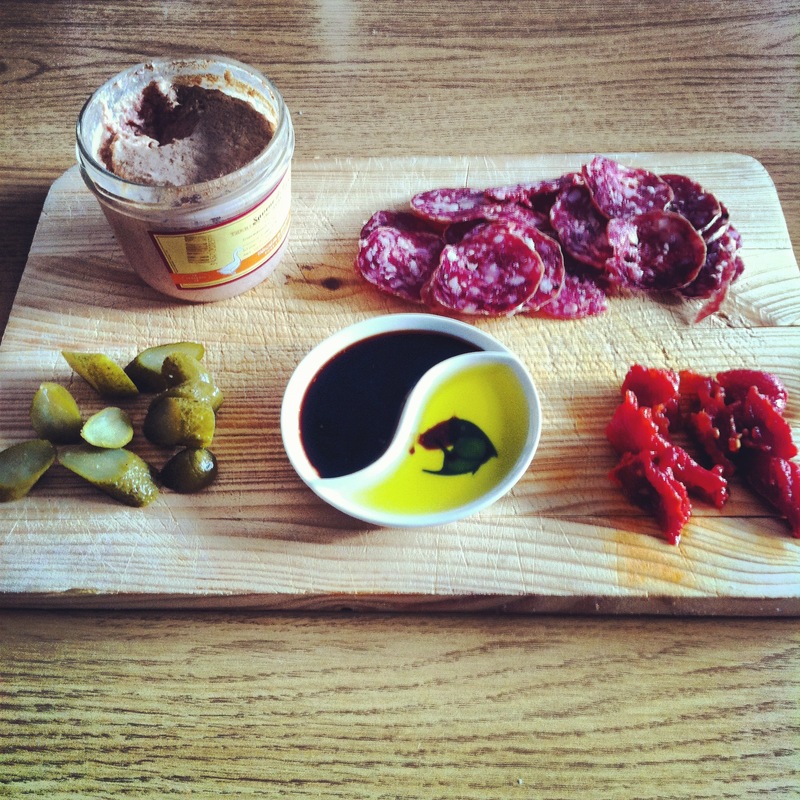 I picked up some saucisson and a little pot of goose liver parfait which we later gobbled down with some bits from the fridge – semi-dried tomatoes and some pickles. 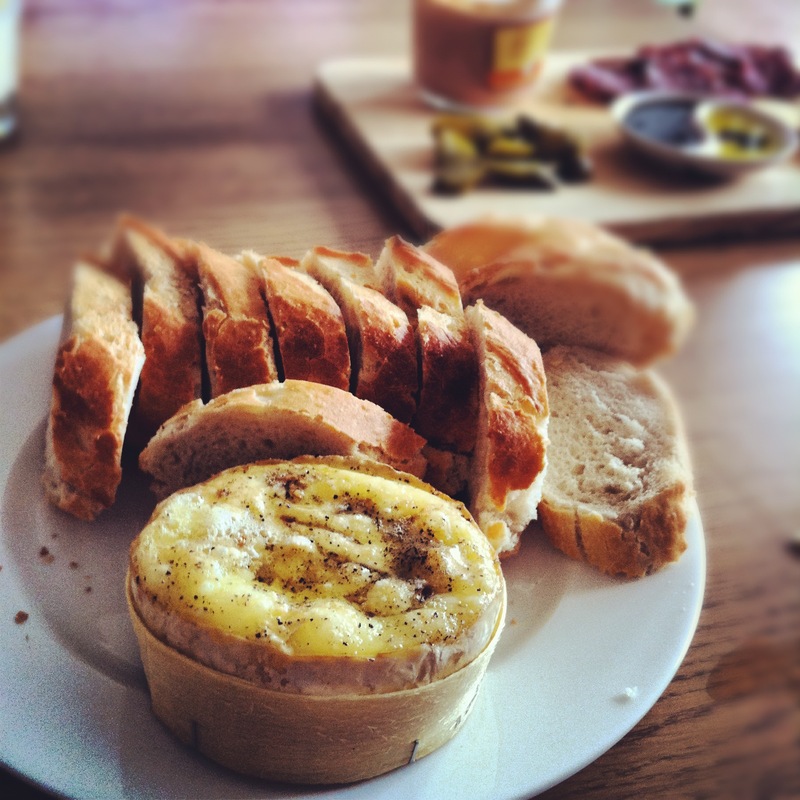 We picked up a petit camembert and a baguette from Waitrose on our way home and had a right little French feast. Lazy, yes, but delicious also. To bake the petit camembert, unwrap and slice the rind from the top of the cheese. Sprinkle black pepper, salt (I used Cornish Garlic pinch salt), a few sprigs of thyme (if you have any) and a good glug of olive oil. Bake in the oven at 200 degrees until it’s bubbly and brown on top. Really yummy with a crusty baguette and some chilli marmalade! 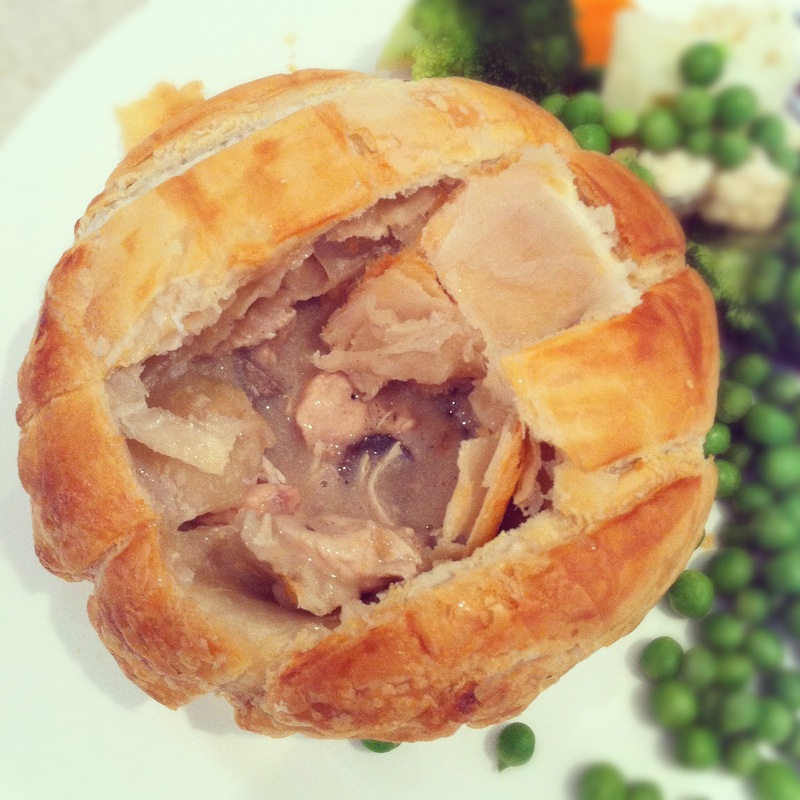 A few days ago, Mr Q sorted out a lovely dinner, just a ready-meal style two-pack of chicken and mushroom pies by Charlie Bigham, available at Waitrose. I wouldn’t ordinarily blog about a cheap-ish ready-meal, but these pies were exceptional. 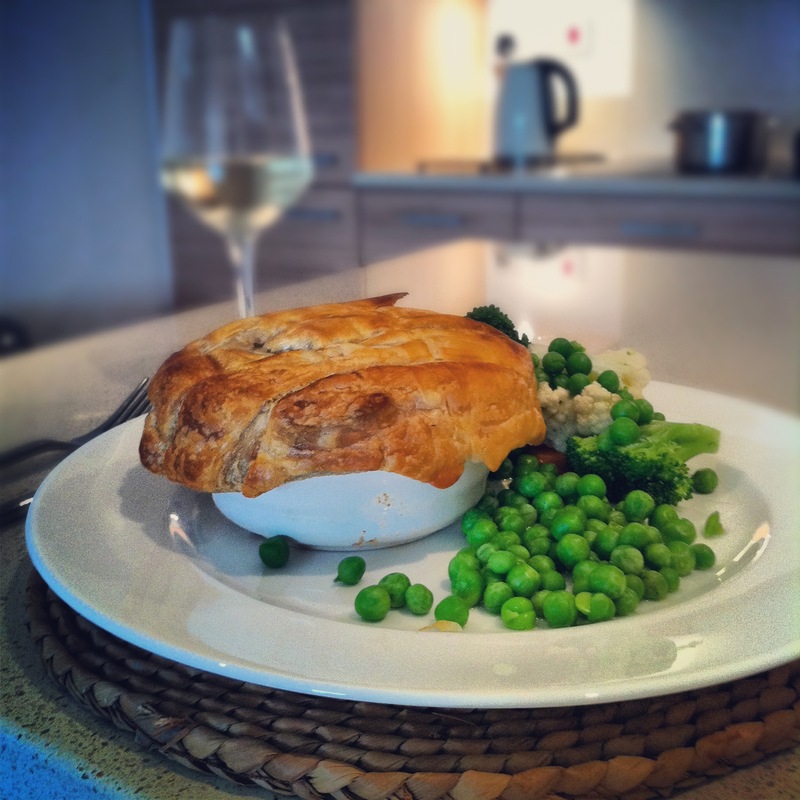 The first thing that struck me about these pies was that they came in a cute little white porcelain pie dish, a lovely touch considering ready-meals usually come packaged in horrible plastic. We weren’t disappointed by the contents of the pies, either. Huge chunks of chicken breast and mushrooms, in a gorgeous white wine sauce that was delicious and deceptively filling. 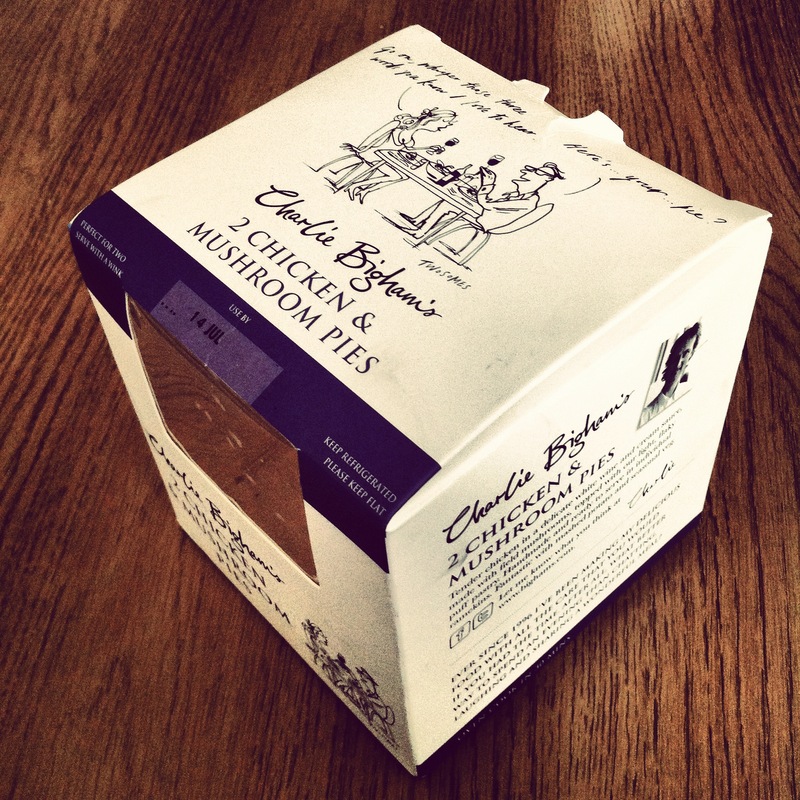 We’ll definitely be purchasing these Charlie Bigham’s pies again, at £6.99 (we got them on special for £5.00) they’re an excellent and easy meal for when cooking is just too much effort! Tags: baked camembert, camembert, Columbia Road Market, food, french food, goose liver parfait, lazy dinners, Pie, ready meals. Bookmark the permalink. This post has made me very hungry. And very hungry at the lack of camembert in my fridge.